Summary: To four girls who have nothing, their friendship is everything: they are each other’s confidants, teachers, and family. The girls are all named Guinevere—Vere, Gwen, Ginny, and Win—and it is the surprise of finding another Guinevere in their midst that first brings them together. They come to The Sisters of the Supreme Adoration convent by different paths, delivered by their families, each with her own complicated, heartbreaking story that she safeguards. Gwen is all Hollywood glamour and swagger; Ginny is a budding artiste with a sentiment to match; Win’s tough bravado isn’t even skin deep; and Vere is the only one who seems to be a believer, trying to hold onto her faith that her mother will one day return for her. However, the girls are more than the sum of their parts and together they form the all powerful and confident The Guineveres, bound by the extraordinary coincidence of their names and girded against the indignities of their plain, sequestered lives. 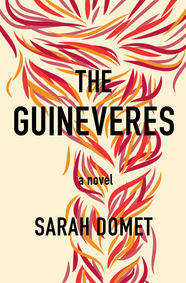 There sure has been a lot of buzz about THE GUINEVERES by Sarah Domet; and after finishing it, I totally understand why. This novel about four teenage girls, all named Guinevere, takes place in a convent; and in many ways, is a coming of age story. I thought this novel was extremely well done, and the writing was certainly something special. THE GUINEVERES tells the story of four Guineveres -- Vere, Gwen, Ginny, and Win. Each girl arrived at The Sisters of Supreme Adoration convent within a few years of each other and become fast friends. They were all left at the convent by their families (with little explanation) and never really had any contact with them. Thankfully, they had each other. Each girl definitely has their own personality, but they all complement each other. One thing they have in common, though, is a desire to leave from the convent and live in the real world. The girls come up with a hysterical plan to hide in one of the floats during the annual festival as a means of escape. Unfortunately, the nuns figure out their plan... that float was darn heavy for a nun to pull! And their punishment is to work in the convalescent ward tending to soldiers and the elderly. When one of the girls at the convent is allowed to leave as a nurse to a recovering soldier, the girls come up with another brilliant escape plan. They each pick out a comatose soldier to tend to with the hopes that the soldiers will fall in love with them. They spend hours caring for these men and are certain that they will recover... and take the girls with them when they leave the convent. I really appreciated THE GUINEVERES! It was a terrific story and truly unlike anything I've ever read, although I have seen some comparisons to THE VIRGIN SUICIDES. It's hard to believe that this is Ms. Domet's debut novel. The writing is so polished and so smart. I'm definitely looking forward to more of her stories in the future. I am pretty certain that I haven't been able to convey just how well written this book is. I feel as if Ms. Domet accomplished quite a bit with this novel, and I loved how well she told these girls' stories. The background stories of the girls' path to the convent were gradually revealed, and I found them to be heartbreaking. As I learned the history of these girls and their parents, it helped to explain their characters' personalities and motivations. In addition, I loved that we discovered what happened to the girls after they left the convent and were out in "the real world." I also love how the author wove the themes of Catholicism into the novel. Of course, there were nuns and an alcoholic priest whose stories were intriguing (and a bit funny!) However, I appreciated that each of the chapters were named after important events in the Catholic faith such as the Ascension, Advent, the Assumption and more. Even more interesting was the author's choice to intersperse a few small chapters on the lives of special female saints like Saint Cecelia and Saint Christina the Astonishing. I know this sounds a little crazy, but it all worked! All in all, my favorite part of this novel was the character development of these four girls. While they all had very different personalities, somehow they all seemed like one. Maybe it's because they all were deserted by their families and they felt trapped in the convent. Or possibly it's because they all had the same dreams of falling in love and escaping. However, I think the author's choices in style also had a major effect on this feeling. While Vere was the primary narrator, she often times used the first person plural to describe their stories. It was a really interesting use of words that most definitely conveyed a unity between the girls. I'm sure it won't surprise you ant THE GUINEVERES would make a terrific book club selection. There is a reading guide available with 22 (wow!) questions, and they are really, really good ones! I think I touched upon many of the themes, but some things you might want to discuss include the feeling of being trapped, friendship, grief, wishes, gender norms, faith, war, wonder, pain, memories, family, and hope. THE GUINEVERES is a fantastic novel for fans of literary fiction. Highly recommended! I grabbed this book at SIBA and can't wait to read it. I'm glad to see it's so good! Loved your review and have added The Guineveres to my TBR list! Great review! I'm even more excited to read this book now.